Six different chefs served up six courses to pair with the BYO wines at the main reboule dinner. Reboule du Rhône, spearheaded by sommeliers Dustin Wilson and Thomas Pastuszak, just completed its second year, with a long weekend of comprehensive seminars and tastings and wine-fueled dinners in New York Nov. 15–18. I attended the first one in 2017 and returned this year to join the 600 or so attendees in some of the events. The proceeds for Reboule go entirely to Share Our Strength's No Kid Hungry campaign, and last month's affair raised more than $250,000. There seems to be great momentum around Reboule, with attendees who had enjoyed themselves last year returning, joined by some new faces who had missed out. One of those was vintner Olivier Clape, who I sat next to at the Friday "Kings of Cornas" dinner at Legacy Records. He was unable to come to New York last year because of his young son (now 2 years old), but jumped at the second iteration. "My grandfather fought for this," said Clape, referring to Auguste, who passed away this year and had worked all of his life to bring recognition to Cornas. Just over 60 years after Auguste became the first in the appellation to bottle his own wine, here we were, surrounded by wine lovers enjoying the Clape 2013, 2006 and 2001. Olivier said he was amazed that people in the U.S. had heard of Cornas, more so than in Paris and Lyon. 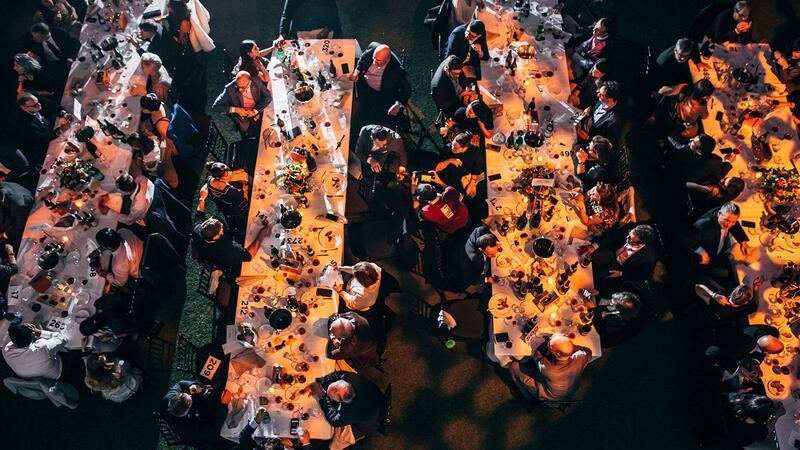 Many wine lovers idolize their favorite producers and bottlings; they collect and drink as many as they can, share the wines with friends or tell them excitedly exactly what they had at their last dinner. But behind these cult wines are normal people, who are humble and passionate about their craft. There's no pomp—at least not in the Rhône. I spoke with Matthieu Barret of Domaine du Coulet, a darling of the natural wine crowd whose wines people go nutty over and which have earned scores of up to 96 points from Wine Spectator. (I tasted the 2013, 2012 and 2011 vintages of Billes Noires at the Cornas dinner.) Barret seemed almost a little surprised at how much the Reboule's organizers insisted he be in attendance. He gave off a vibe of: "Who, me?" Vigneron modesty aside, the Saturday reboule dinner was quite the embarrassment of riches, with each guest and the dozen winemakers in attendance bringing bottles to pour for their table. At mine, I got acquainted with Guillaume Monier, who poured a magnum of his Domaine Monier-Perréol St.-Joseph Laliefine 2014. From another table, Jean-Baptiste Souillard came over and poured his St.-Péray Chalaboud 2014, proudly explaining that it was the first vintage of his namesake label. I brought a bottle of Jean-Michel Gerin Côte-Rôtie La Viallière 2012, which Condrieu producer André Perret "borrowed" from our table and never brought back. It's OK, I'm not bitter—especially because I got to taste Perret's 2006, 2008 and 2009 vintages, which some of my table companions had provided. One of them was Nicholas Sheets, a private equity lawyer who fell in love with wine at a dinner in Hong Kong several years ago, and has been exploring Burgundy ever since. He said he wasn't too familiar with the Northern Rhône yet; some of his buddies who were fans had brought him here, and he had picked up a Thierry Allemand Cornas Chaillot 2001 for the occasion, which was drinking beautifully. On my other side, Rita Jammet, owner of the now-closed La Caravelle restaurant, exclaimed: "I'm going to have Chave in my blood tonight." She had brought a magnum of the producer's 1999 vintage, and coincidentally someone else had brought the 1998. Amid all this extravagance, it was not lost on people why we were all there. No Kid Hungry, which helps feed thousands of children across the U.S., is a natural partner for the restaurant industry's charitable givings. Among the guests on Friday were longtime supporter Carrie Abramson, who used to work in nonprofits and wrote her M.B.A. thesis on Share Our Strength many years ago, and her husband Leigh, who is on No Kid Hungry's Leadership Council. He also happens to be a wine collector and loves Northern Rhône wines. "And I'm a fan of whatever Leigh pours!" said Carrie. Not even through our second course that same night, Olivier Clape was already talking about next year's event, saying he wanted to get even more producers from the region to come to New York. It's all about momentum … and I think Reboule du Rhône is here to stay.